By academic training, I am a medievalist and therefore well use to enduring the frustrations of the disappeared. Specifically, the disappearance of invaluable manuscripts, administrative, theological and literary, lost in the Reformation destruction of the libraries of this country’s religious houses. The knowledge that the loss is permanent and that no amount of searching is likely to bring them to light, at least provides me with a fall-back position of resigned stoicism in order to occasionally lift my spirits. In trying to compile a full catalogue of Peter Brannan’s work, I have also felt the frustration of the disappeared, but without the dubious consolation of knowing that paintings and drawings have gone, never to return. The frustration is not so much that the world has lost sight of so many important works, although that is bad enough, but more to do with sensing that somewhere out there, hanging on a wall, stored in a wardrobe or forgotten in an attic, are those works of art. It is improbable that they have fallen victim, as the medieval manuscripts did, to the iconoclastic zeal of religious reformers; it is more likely that they have withstood the less dramatic and more temporary setback of lapses in memory, contempt for the familiar or just solid bouts of indifference. There are many more than the nearly thirty paintings listed below which I have not yet tracked down, but these represent works which would significantly help in establishing a much fuller understanding of Peter Brannan’s artistic development, and in a variety of different ways. Some of them, notably Coal Mine, Coal Mine in the Snow, Landscape with Coal Mine, Near a Coal Mine, Pit Head, Pit Yard, Resting Miner, The Coal Mine and The Mine, represent part of a larger distinct group of paintings, in which Brannan casts his eye away from the Lincolnshire landscape and seaside in order to focus upon the industrial and post-industrial.The restoration of these paintings to public view would be of great interest in terms of Peter Brannan’s personal history, as he did his first year of National Service as a Bevin Boy at the Nunnery Colliery, Handsworth, Sheffield, and may be drawing on that experience in those works. One-Man Exhibition, Usher Gallery, Lincoln, 1978, Number 34, NFS, on loan from a private collection, is probably the same painting. Trafford Gallery, Mayfair, London, Fifth One-Man Exhibition, 1969, Number 26. 55th Lincolnshire Artists’ Society Annual Exhibition, Usher Gallery, Lincoln, 1961, Number 29, 25 guineas. 40th Lincolnshire Artists’ Society Annual Exhibition, Usher Gallery, Lincoln, 1946, Number 7, 3 guineas, watercolour. 48th Lincolnshire Artists’ Society Annual Exhibition, Usher Gallery, Lincoln, 1954, Number 61, 18 guineas, oil painting. 39th Lincolnshire Artists’ Society Annual Exhibition, Usher Gallery, Lincoln, 1945, Number 139, 6 guineas, watercolour. 39th Lincolnshire Artists’ Society Annual Exhibition, Usher Gallery, Lincoln, 1945, Number 198, 3 guineas, watercolour. 69th Lincolnshire Artists’ Society Annual Exhibition, Usher Gallery, Lincoln, 1975, Number 110, £150. Trafford Gallery, Mayfair, London, Third One-Man Exhibition, 1965, Number 13. One-Man Exhibition, Willoughby Memorial Trust Gallery, Corby Glen, 1988, Number 26, £180. twice exhibited in the early 1950’s, as was the ink and wash Landscape, near Hereford. The Chester picture was quite possibly a preparatory study for the larger scale oil painting exhibited in Lincoln a few years later, titled Landscape, Chester. Brannan also produced a painting of Chester’s lunatic asylum during this period, titled The Asylum, Chester, although until the work is re-discovered, we cannot say what Brannan actually painted, as the Deva Lunatic Asylum’s architecture is a story of complex accretions from the time of its original foundation in 1829. 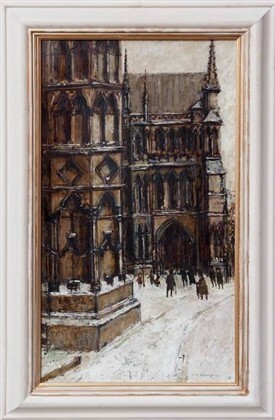 Like his brother Noel in the 1940’s, Peter Brannan focussed upon Bath as a subject, a lovely cathedral city in a picturesque setting, as with Chester and Hereford: although unlike his brother, the work was an oil painting rather than a watercolour; also in contrast to his brother, it appears to have been a one-off piece only. Further North from all these locations, a painting titled Cumberland Town remains a mysterious oddity exhibited in London in the late 1960’s; whilst a small painting titled London Square is an equally intriguing work, which was exhibited in Lincoln. The title of the latter, in its lack of useful specificity, is as unhelpful as that used in the Cumberland painting. Trafford Gallery, Mayfair, London, Fifth One-Man Exhibition 1969, Number 27. 41st Lincolnshire Artists’ Society Annual Exhibition, Usher Gallery, Lincoln, 1947, Number 5, 6 guineas. 49th Lincolnshire Artists’ Society Annual Exhibition, Usher Gallery, Lincoln, 1955, Number 36, 30 guineas. 44th Lincolnshire Artists’ Society Annual Exhibition, Usher Gallery, 1950, Number 112, 5 guineas. Foyles Exhibition, Charing Cross, London, 1951, 5 guineas. 44th Lincolnshire Artists’ Society Annual Exhibition, Usher Gallery, 1950, Number 96, 3 guineas. Foyles Exhibition, Charing Cross, London, 1951, 3 guineas. 67th Lincolnshire Artists’ Society Annual Exhibition, Usher Gallery, Lincoln, 1973, Number 18, £50. 42nd Lincolnshire Artists’ Society Exhibition, Usher Gallery, Lincoln, Number 64, 1948, 8 guineas. It has often been noted that Peter Brannan was interested in architecture and indeed many of his best works are dominated by impressive architectural structures, both real and invented. Many of his road trips around Lincolnshire in search of antiques often included photographing interesting parish churches as part of the itinerary. It is not surprising, therefore, that he produced a group of paintings which reflect an admiration for ecclesiastical architecture. Of this small group of works only one, The Cathedral (1965), has not disappeared from view: four others, however, remain elusive. Covenham Abbey, later re-titled more accurately as Covenham, St Mary’s, is a small scale wash and drawing, which was also twice exhibited alongside the landscapes of Chester and Hereford at the beginning of the 1950’s. It takes as its subject matter the handsome C14th Parish Church, approximately five miles north of Louth, which is now a Grade II listed building. Based on the scant information of the exhibition catalogues, it is apparent that Brannan in the 1960’s had the confidence to move away from the modest wash and drawing of a parish church to produce paintings, possibly large-scale, of ecclesiastical buildings, and focussed specifically upon Lincoln Cathedral. The magnificence of church architecture was not a subject to which he returned after this date, it seems, except by way of the occasional picture of a small parish church, as seen in Winter Landscape with Church, for example, or as a background detail, often a spire, to secular architecture. 44th Lincolnshire Artists’ Society Annual Exhibition, Usher Gallery, 1950, Number 155, 5 guineas. Foyles Exhibition, Charing Cross, London, 1951, 5 guineas, amended to Covenham St Mary’s. 61st Lincolnshire Artists’ Society Annual Exhibition, Usher Gallery, Lincoln, 1967, Number 96, 50 guineas. Trafford Gallery, Mayfair, London, Third One-Man Exhibition 1965, Number 17. Trafford Gallery, Mayfair, London, Third One-Man Exhibition 1965, Number 3, possibly the same painting shown at Peter Brannan’s 1978 One-Man Exhibition at the Usher Gallery, Number 47, NFS, Private Collection, titled Cathedral; on the other hand, this may be the painting titled The Cathedral, also for sale in the Third One-Man Exhibition at the Trafford Gallery, 1965, Number 4, and now in a Private Collection. 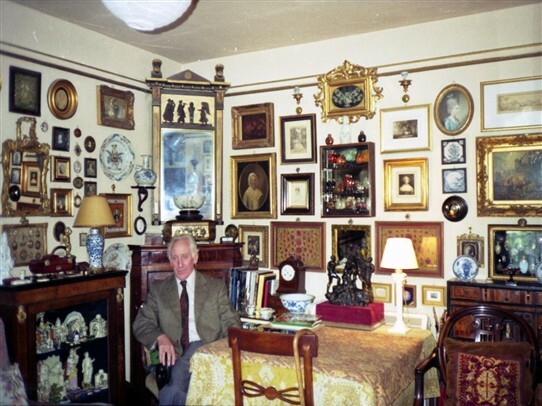 It is a commonplace of the available biographical notices and interviews that Peter Brannan was a collector of antiques, especially of oriental artefacts, and that he was a frequent visitor on a Saturday afternoon to Strait Antiques in Lincoln run by Florence Davies who specialised in dolls, pottery and fine porcelain. In many respects, there is a sense that he painted to fund his collecting of beautiful objects with which he surrounded himself in his Welbourn Cottage. Many of his treasured possessions were used in his Still Life paintings, creating an oddly symmetrical pattern of selling a painting to buy an objet d’art which became the subject of another painting, which in turn provided the money to buy another objet d’art, and so on. The astonishment of the Sotheby’s Auction House valuer, who turned up at the Welbourn cottage after Brannan’s death, expecting just another routine two hour assignment, is not surprising. The missing paintings which would add to our knowledge of Brannan’s creative use of his collecting habit are quite different in many respects. One is simply is a missing painting of a gothic clock, presumably from the C19th,which was exhibited at Elsham Hall, Brigg, in 1989. The others are less straightforwardly lost, in that it is difficult, without more detailed knowledge, to work out whether we are dealing with one, two or even three paintings with the same subject, but with slightly different titles. Elsham Hall, Brigg, One-Man Exhibition 1989, Number 25, £300. One-Man Exhibition, Usher Gallery, Lincoln, 1978, Number 2, £75. Trafford Gallery, Mayfair, London, Fifth One-Man Exhibition, 1969, Number 24. 62nd Lincolnshire Artists’ Annual Exhibition, Usher Gallery, 1968, Number 26, 35 guineas. The final group of paintings is quite simply a miscellaneous collection of titles which are so distinctive and idiosyncratic that they do not always seem to fit into the usual broad categories of Brannan works. Many questions concerning the genesis of these paintings could be asked which would only be answered by seeing them. Playing Cricket is the only work by Brannan which has sport as its subject, as far as I know, for example; whilst the The Bell Inn is possibly theonly representation of a public house that Brannan did after the early dark interiors of Irish Bar Room Interior (1951) and The Barman (1955), although an early exhibition painting from the 1940’s, titled Domino Players, may also be set in a pub interior: unfortunately, this painting has also disappeared from sight. Collecting Firewood and Tree Climbing may be typical representations of childhood, but until these two paintings re-appear, as with the other works which are for the moment lost, it is clearly impossible to make a secure judgement about them. Perhaps the most intriguing of all the lost paintings is Les Fleurs du Mal, suggesting the poetry of Charles Baudelaire which by the middle of the C20th was a classic of French Literature; on the other hand, the title may be just a descriptive one or may even just refer to an image of the book of poems itself. We will only find that out should the painting, like all the others, be re-discovered at some time in the future; but then again, we may just have to stoically accept the frustrating possibility that it never will and that we will never know. Trafford Gallery, Mayfair, London, Fifth One-Man Exhibition 1969, Number 4. 39th Lincolnshire Artists’ Annual Exhibition, Usher Gallery, Lincoln, 1945, Number 9, 5 guineas. 41st Lincolnshire Artists’ Annual Exhibition, Usher Gallery, Lincoln, Number 14, 1947, 7 guineas. Trafford Gallery, Mayfair, London, Fifth One-Man Exhibition 1969, Number 17. 66th Lincolnshire Artists’ Annual Exhibition, Usher Gallery, 1972, Number 44, £65. One-Man Exhibition, Willoughby Memorial Trust Gallery, Corby Glen, 1988, Number 3, £110. 47th Lincolnshire Artists’ Annual Exhibition, Usher Gallery, 1953, Number 49, 10 guineas. This page was added by Website Administrator on 29/04/2017.